This article was first published by the Journal of Pension Benefits: Issues in Administration, Design, Funding, and Compliance, Autumn 2018, Vol. 26, No. 1. Although the viability of arbitration rather than litigation in ERISA fiduciary breach claims remains to be seen, there are several considerations for employers who may, in the future, need to decide whether to incorporate arbitration provisions and class action waiver provisions in their plans and employment agreements. In Epic Systems Corp. v. Lewis [138 S. Ct. 1612, 1616 (2018)], the Supreme Court recently decided that arbitration provisions in employment agreements are enforceable to preclude class action lawsuits. The Court held that, although the National Labor Relations Act (NLRA) authorizes employees to engage in “concerted action” (such as the right to unionize), it does not confer an independent right to file class action lawsuits and it does not conflict with the Federal Arbitration Act (FAA), which encourages courts to enforce private arbitration agreements. In this article, we briefly discuss Epic Systems, and the more recent decision by the Ninth Circuit Court of Appeals in Munro v. University of Southern California. Then, we offer some thoughts that employers might consider in deciding whether to incorporate arbitra-tion provisions and class action waiver provisions in their plans and employment agreements, assuming those provisions are ultimately found to be enforceable outside the Ninth Circuit. In Epic Systems and its companion cases, employers and employees entered into contracts providing for individualized arbitration proceedings to resolve employment disputes. The Supreme Court’s opinion, drafted by Justice Neil Gorsuch, broadly framed the resulting issue as follows: “Should employees and employers be allowed to agree that any disputes between them will be resolved through one-on-one arbitration? Or should employees always be permitted to bring their claims in class or collective actions, no matter what they agreed with their employers?” The issue highlighted tension between the FAA and the NLRA. While the FAA has been found to establish “a liberal federal policy favoring arbitration agreements,” the NLRA confers on employees a right to engage in “concerted activity” to address alleged wrongs in the workplace. Before Epic Systems, some courts inter-preted the right to engage in “concerted action” to include the right to pursue class action claims to right alleged wrongs in the workplace, and not merely the right to organize, unionize, and engage in collective bargaining. One of the companion cases that the Court decided in Epic Systems was Morris v. Ernst & Young, LLP [834 F.3d 975 (9th Cir. 2016)]. The plaintiff in Morris signed an employment agreement providing for individualized arbitration. That provision required that claims pertaining to different employees be heard in separate proceedings. The provision, there-fore, arguably prevented Mr. Morris from bringing a class action to redress an employment dispute. Ernst & Young sought to compel arbitration. The district court agreed that the matter should be arbi-trated. The Ninth Circuit reversed on the grounds that requiring arbitration would violate the NLRA, because it would bar employees from engaging in “concerted activity” of pursuing their claims as a class or collective action. What Does Epic Systems Mean for ERISA Cases? Before Epic Systems, plaintiffs were generally suc-cessful in arguing that arbitration provisions in their employment agreements could not compel arbitration of fiduciary breach claims filed under ERISA § 502(a)(2) [29 U.S.C. § 1132(a)(2)]. In some of those pre-Epic Systems cases, plaintiffs relied on cases brought under the NLRA, and guidance by the National Labor Relations Board, that refused to enforce arbitration provisions that would have infringed on an employee’s right to engage in collec-tive action (i.e., actions that would impact the labor rights of a large group of employees). Claims under ERISA § 502(a)(2) are, in a manner of speaking, “collective actions” in their own right. This is because claims under that section are brought on behalf of—and inure to the benefit of—the ERISA plan itself. For example, a typical breach of fiduciary duty case in recent years might involve a claim by a 401(k) plan participant that the investment management fees associated with the plan’s investment options were unreasonable. Plaintiffs claiming damages as a result do so on behalf of the plan as a whole, and not in their own individual capacity. Many of those cases are brought as class action lawsuits, and any recovery—either through settlement or by a court judgment—will land in the plan’s account. In the wake of Epic Systems, ERISA plaintiffs who previously might have relied on decisions in NLRA cases will have one less arrow in their quiver when they argue that arbitration provisions are not enforceable. On the other hand, federal courts have long recognized, as ERISA itself does, that “Congress enacted ERISA to ‘protect … the interests of participants in employee benefit plans and their beneficiaries’ by setting out substantive regulatory requirements for employee benefit plans and to ‘provid[e] for appropri-ate remedies, sanctions, and ready access to the Federal courts.’” Aetna Health Inc. v. Davila [542 U.S. 200, 208 (2004)]. Courts in future ERISA cases will, therefore, pre-sumably confront a potential conflict between these remedial considerations—including ERISA’s policy of “ready access to the Federal courts”—and the FAA’s requirement that courts “rigorously” enforce arbitration agreements according to their terms. Courts will either determine that Epic Systems dictates the outcome in those ERISA cases (and, therefore, enforce arbitration agreements) or distinguish Epic Systems, perhaps on the grounds that ERISA, unlike the NLRA, expressly dictates that participants and ben-eficiaries necessarily act in a representative capacity when they bring a claim for breach of fiduciary duty. The issue has already come to a head in the United States Ninth Circuit Court of Appeals. In Munro v. University of S. California [2017 WL 1654075 (C.D. Cal. Mar. 23, 2017)], the plaintiffs agreed to arbitrate disputes with their employer, the University of Southern California (USC). Each of the plaintiffs participated in a retirement plan offered by USC. They alleged that members of the plan committee that oversaw the plan breached their fiduciary duties, and USC moved to enforce the arbitration provisions. The plaintiffs argued that, although they may have signed arbitration agreements, they could not have bound the plan to arbitration, only themselves. And, since breach of fiduciary duty actions brought under ERISA § 502(a)(2) [29 U.S.C. § 1132(a)(2)] are brought on behalf of a plan, the arbitration clauses they signed did not prevent them from filing suit on the plan’s behalf in federal court. 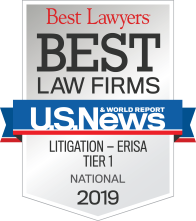 One of ERISA’s main purposes is “[t]o protect pension plans from looting by unscrupulous employers and their agents.” [Citing Landwehr v. DuPree, 72 F.3d 726, 733 (9th Cir. 1995)]. If the Court were to hold participants’ arbitration agreements controlled their § 502(a)(2) claims, fiduciaries could mitigate their ERISA obligations to their plans and erect barriers to ERISA enforcement on behalf of plans by requiring employees to sign arbitration agreements—including provisions requiring confidentiality, expedited arbitration procedures, limited discovery, required splitting of arbitrators’ fees, and mandatory payment of the prevailing party’s attorneys’ fees—as a condition of employment. Looking Forward: Even If Other Courts Hold That Arbitration and Class Action Waiver Provisions Are Enforceable, Are They Always Desirable? As indicated above, although the Ninth Circuit Court of Appeals has refused to apply arbitration agreements entered into by individual employees to ERISA fiduciary breach cases, courts outside the Ninth Circuit will be free to reach a different conclusion. This would set up a conflict between the Circuits, and ultimately, the potential for the issue of whether these arbitration provisions are enforceable to reach the Supreme Court. Certainly, Epic Systems weighs in favor of enforcing arbitration agreements generally. But assuming that the law evolves to more clearly require courts to enforce those provisions in ERISA cases, employers should give serious consideration to whether they want to include those provisions in their employment agree-ments and/or plan documents, or attempt to compel arbitration of cases that would otherwise be litigated in federal court under ERISA. The decision is not as straightforward as it may at first seem. Traditionally, arbitration has been viewed to have several potential advantages over litigation. The first and most frequently cited of those advantages is lower cost. Generally speaking, arbitration proceedings are less formal than litigation. The parties may effectively limit the amount of discovery they may conduct in arbitration to a greater extent than they may be able to in litigation—and because discovery and depositions often make up the costliest aspect of any adversarial proceeding, the savings in discovery costs alone can be substantial. Moreover, arbitration typically has been viewed as a more “defendant-friendly” forum than litigation. After all, large corporations are frequent targets of litigation, and, therefore, they are “repeat users” of both the courts and alternative dispute resolution providers, including arbitrators. This leads some to believe that arbitrators have a built-in bias in favor of corporations and other institutional parties who may be inclined to hire arbitrators that have a defense-friendly reputation. Whether and to what extent these traditionally held notions about the advantages of arbitration are true is open to some debate. It may be true that, all else being equal, the relative informality of arbitration results in less expense. However, virtually all ERISA trials are presided over by federal judges without juries. (Typically, jury trials are substantially more expensive than bench trials, in which the judge is the finder of fact.) With some variance in approach, federal district judges typically exercise a fairly strong hand over the conduct of trials in their courtrooms. For example, some judges set strict time limits on the parties in connection with their presentation of evidence. Conversely, in an arbitration forum, the arbitrator decides how the proceedings will be conducted, and whether to impose time limits on the parties in presenting evidence. And because arbitrators are typically paid for their time by the parties, the arbitrator has no particular disincentive (or at least, no economic disincentive) to restrain the parties in their presentation of their cases. Thus, while the process leading up to the actual arbitration may be less formalistic and, therefore, potentially less expensive than litigation, the arbitration hearing itself may be substantially lengthier than its trial counterpart. And, a reputable arbitrator’s fee is significant, often exceeding a five-figure daily expense in major metropolitan areas. Consequently, employers should not be quick to assume that arbitration will be substantially less expensive than litigation. Perhaps more importantly, arbitrators are not strictly bound to follow the law that governs federal trial courts. And parties typically have limited rights to appeal an arbitrator’s decisions. Some attorneys believe that these factors combine to cause arbitrators to be more likely than federal judges to “split the baby in half” and render decisions that give both parties some measure of success (and failure). Whether that belief is true or not, however, is difficult to put to the test in a system where parties have very limited rights to appeal, and, therefore, the arbitrator’s decision will not be scrutinized to determine whether it is supported by the evidence and legally correct. Employers—who are potential defendants in ERISA fiduciary breach cases—should not take these considerations lightly. 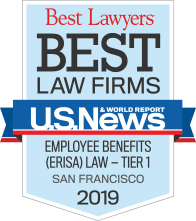 Although, as stated above, ERISA has as one of its primary goals protecting employee benefits, the case law often gives deference to and effectively protects fiduciaries in meaningful ways. For example, courts are obligated to “… judge a fiduciary’s actions based upon information available to the fiduciary at the time of each investment decision and not from the vantage point of hindsight.” [Pension Ben. Guar. Corp. ex rel. St. Vincent Catholic Med. Ctrs. Retirement Plan v. Morgan Stanley Inv. Mgmt. Inc., 712 F.3d. 706, 716 (2nd Cir. 2013)] That type of legal consideration provides real protec-tion to fiduciaries in litigation—protection to which arbitrators are not obligated to adhere and cannot be compelled to provide. Finally, even if courts enforce waivers of class actions in the ERISA setting, employers who rely on those provisions may gain little solace. One benefit of class action litigation to defendants is to gain certainty and an end to litigation that might otherwise be pursued by numerous individual plaintiffs. Serial litigation by large numbers of individual plaintiffs all seeking relief under a similar theory that applies to most if not all plan participants may amount to “death by a thousand cuts.”In short, employee benefit plan sponsors should be thoughtful about whether to incorporate and seek to enforce arbitration agreements in connection with their plans. The disadvantages of arbitration are arguably equally as compelling as its advantages.